Industrial processes are procedures involving chemical, physical, electrical or mechanical steps to aid in the manufacturing of an item or items, usually carried out on a very large scale. Industrial processes are the key components of heavy industry. Pyroprocessing – using heat to chemically combine materials, such as in cement. 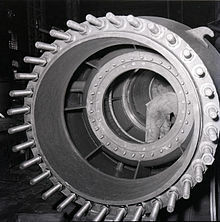 The availability of electricity and its effect on materials gave rise to several processes for plating or separating metals. Smelting and direct Reduction – extracting metals from ores. Work hardening – adding strength to metals, alloys, etc. The physical shaping of materials by forming their liquid form using a mould. Blow molding as in plastic containers or in the glass container industry – making hollow objects by blowing them into a mould. Many materials exist in an impure form, purification, or separation provides a usable product. In additive manufacturing, material is progressively added to the piece until the desired shape and size are obtained. The nature of an organic molecule means it can be transformed at the molecular level to create a range of products. This page was last edited on 18 April 2019, at 17:43 (UTC).